Armed with a secondhand 1961 Fender Stratocaster that would soon become recognized as his trademark axe, Gallagher began a tenure with the Fontana Showband. The Fontana Showband [later renamed the Impact Showband] toured Ireland regularly, performing cover versions of pop songs for dances. Despite the obvious creative limitations, the Showband's constant touring was, nonetheless, extremely valuable to Gallagher, providing him with some much needed professional seasoning while also allowing him time to define his sparse, but high energy guitar style. In August 1966, Gallagher ventured out on his own, forming Taste, with bassist Eric Kitteringham and drummer Norman Demery. This three-piece unit toured Britain, Germany and Ireland, where Gallagher's stinging leads and furious bottleneck slide playing earned Taste a small but loyal following. Unlike many of his contemporaries who preferred the raucous, 1950’s Chicago based recordings of Muddy Waters, Howlin’ Wolf and Otis Rush, Gallagher loved the rural, country blues of such early pioneers as Son House, Tampa Red and Big Joe Williams. As a result, Taste's repertoire was comprised of Gallagher's spirited originals liberally interspersed with adaptations of songs by Robert Johnson, Leadbelly and Blind Boy Fuller. By May of 1968, with the British Blues movement in full bloom, Gallagher relocated to London. There, he formed new version of Taste with ex-Spencer Davis bassist Charile McCracken and drummer , John Wilson, formerly of Them. Amid the likes of Alexis Kormer and John Mayall's Bluesbreakers, Gallagher's fiery playing caught the attention of many, including Polydor Records, who soon signed the trio to a recording contract. Released in 1969, Taste , the groups debut album, provided an accurate representation of the band's development to date, mixing Gallagher's originals along with raw reworkings of such blues standards as 'Catfish' and Leadbelly’s ‘Leavin’ Blues. - Seemingly more heavy metal than delta blues, ‘Catfish” provided a forum for Gallagher's blistering lead work. Shunning excess sound effects, guitar devices and studio experimentation in general, tracks such as ‘Catfish' were simply cut live in the studio in an effort to replicate the energy of the band's live performances. 'Blister On The Moon” defined the band's sound and style perfectly; spartan, riff-driven, high intensity blues rock. ‘Same Old Story,” a staple of the group's live performances, was indicative of Gallagher's compositional approach; tight arrangements, insistent vocals and the guitarist's muscular riffing. Apart from his affinity for American blues, Gallagher's other musical influences also came to the fore. The melodic “Born On The Wrong Side Of Town” showcased Gallagher's combination of folk and rock, successfully blending his acoustic and electric playing. ‘Hail” and "I'm Moving On” were both superb, revealing Gallagher's skill as both a writer and interpreter, as well as offering a glimpse of his furious bottleneck slide technique. While Taste barely dented the UK charts and missed the US charts entirely, the band's fast expanding following regularly ventured out to hear Gallagher's passionate and uncompromising brand of blues across Britain, Ireland and Europe. 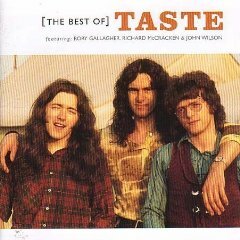 As a result, Taste soon became one of Britain's most popular live attractions. On stage, Taste offered their audiences little in terms of colored light shows or other such psychedelic display. Gallagher was equally unpretentious, regularly performing in a simple plaid, flannel shirt, while shunning any special stage costume. The band's earnest, earthy sincerity struck a chord with their audiences. whose response, measured by the band's steady string of sold out performances, was obviously favorable. Building on this momentum, Taste really hit their stride with 1970’s superb On The Boards. Their sound refined and reputation firmly established, the album's production was vastly improved —with their arrangements growing in sophistication and Gallagher's vocals more clearly audible. Taste now seemed able to harness the energy of their stage performances into their studio recordings. "What's Going On,” was especially noteworthy, full of Taste's much vaunted stage vitality, without having sacrificed the benefits offered by multitrack recording. More familiar with the studio environment Gallagher's creative range expanded, allowing for the incorporation of different instruments, riffs and nuances — such as the moody saxophone of ‘On The Boards”, and the stylish swing of ‘It’s Happened”. The public response was immediate, and the album was an intentional sales success, especially in Britain, reaching #18 on the UK album charts. Despite the group's commercial success, Gallagher remained nonplused. thinking such sales techniques were beneath the purity of the blues music they loved, Taste abandoned the pop singles market and largely disdained of promotional appearances on television. Driven by his love for the blues, Gallagher, hunched over his battered Stratocaster, seemed as equally at ease in a pub setting or on the festival stage. With Taste having become one of the most popular attractions on the European circuit, next effort was to capture selected highlights of their live show on disc. Live Taste, released in 1971, successfully accomplished this. Taste's reworkings of “Sugar Mama” and Big Bill Broonzy’s ‘I Feel So Good” provided two more fine examples of Gallagher's updating of rural blues standards, both marking the guitarist's increasing confidence and ability. By 1971, having now ascended toward the forefront of the British blues movement, relations between Gallagher, Wilson and McCracken deteriorated. Despite their prospects for continued success, Taste ultimately disbanded. Though the band had already formally split, Polydor, lacking new studio recordings to fill the gap, eventually issued Live At The Isle Of Wight in 1972. While the performance had been originally recorded in August 1970, the album served as a worthy companion to Live Taste. Taste's performance at the festival, as evidenced by the salacious ‘Sinner Boy” included on this compilation, had been one of the highlights of the massive, outdoor event. Following his departure from Taste, Gallagher bloomed as a solo artist, adding bassist Gerald McAvoy and drummer Wilgar Campbell, while scoring with Rory Gallagher and Deuce, both issued in 1971. As he had done with Taste, Gallagher continued to front a three-piece band. Though the musicians around him had changed, Gallagher's steadfast commitment to the blues had not. The following year, Gallagher finally broke through with Live In Europe, a searing, high velocity live compilation which cracked the UK top ten. On the heels of Live In Europe, Gallagher had now come to enjoy increased success and visibility in the US. Via high profile guest stints on 1972’s Muddy Waters’ London Sessions and 1973’s Jerry Lee Lewis’ London Sessions, Gallagher's international reputation was further enhanced. In June 1972, having retained McAvoy on bass, Gallagher recruited drummer Rod DeAth and Lou Martin on keyboards, marking his first divergence from the trio concept. Using this line-up, Gallagher would issue three more successful albums for Polydor before switching over to Chrysalis in 1975. Largely due to his tireless commitment to touring, Gallagher's tenure at Chrysalis was equally successful. Following 1976’s Calling Card, Campbell and Martin left, signaling a return to the power trio format. Gallagher enlisted drummer Ted McKenna and continued to expand his following throughout the world. A powerhouse in Europe, Gallagher strengthened his US audience base first as an opening act for such stadium sized attractions as ZZ Top, then later as a headliner on his own. working clubs and theaters across the country.